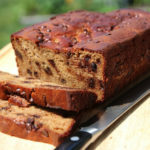 This slightly gooey and deliciously moist Chocolate Chip Banana Nut Bread is none like you’ve never had before! In a large mixing bowl add almond butter, bananas, eggs, maple syrup, vanilla and salt. Mix with a wooden spoon or a hand held mixer until well combined. Add baking soda and place the vinegar over top of baking soda. It will fizz up. Fold this into the batter. The batter will become lighter in texture. Grease a regular size loaf pan (see link below) and pour the batter into it. Top with a small handful of mini chocolate chips and bake for 50-60 minutes or until a toothpick comes out clean. Cool and serve. Store in refrigerator.